คืนวันที่ 15 เมษายน พ.ศ. 2541 ก่อนการฉลองครบรอบ 23 ปี การยึดครองพนมเปญของเขมรแดง สถานีวิทยุเสียงแห่งอเมริกาออกอากาศว่า เขมรแดงตกลงใจจะส่งตัวพล พตให้ศาลนานาชาติ ภรรยาของเขาให้การว่า พล พตเสียชีวิตบนเตียงในคืนที่รอการเคลื่อนย้ายไปยังที่อื่น ตา มก กล่าวว่าเขาเสียชีวิตเพราะหัวใจล้มเหลว โดยอธิบายว่า พล พตนั่งรอรถยนต์มารับ แต่รู้สึกเหนื่อย ภรรยาจึงให้เขาไปพักผ่อน เขาจึงไปนอนและเสียชีวิตเมื่อเวลา 22.15 น. ↑ "BBC – History – Historic Figures: Pol Pot (1925–1998)". BBC. สืบค้นเมื่อ 25 January 2011. ↑ "Pol's Post daughter weds". The Phnom Penh Post. 17 March 2014. สืบค้นเมื่อ 29 June 2014. ↑ "Red Khmer," from the French rouge "red" (longtime symbol of socialism) and Khmer, the term for ethnic Cambodians. ↑ Heuveline, Patrick (1998), "Between One and Three Million": Towards the Demographic Reconstruction of a Decade of Cambodian History (1970-79), Population Studies, Vol. 52, Number 1: 49-65. ↑ Craig Etcheson, After the Killing Fields (Praeger, 2005), p. 119. ↑ Locard, Henri, State Violence in Democratic Kampuchea (1975-1979) and Retribution (1979-2004), European Review of History, Vol. 12, No. 1, March 2005, pp. 121–143. ↑ 7.0 7.1 Heuveline, Patrick (2001). "The Demographic Analysis of Mortality in Cambodia." In Forced Migration and Mortality, eds. Holly E. Reed and Charles B. Keely. Washington, D.C.: National Academy Press. ↑ Chandler, David (23 August 1999). "Time necropsy". Time Magazine. Archived from the original on January 26, 2009. สืบค้นเมื่อ 27 February 2009. ↑ Horn, Robert (25 March 2002). "Putting a Permanent Lid on Pol Pot". Time Magazine. Archived from the original on May 31, 2009. สืบค้นเมื่อ 3 September 2008. ↑ Seth, Mydans (6 August 1997). "Pol Pot's Siblings Remember The Polite Boy and the Killer – Page 2". New York Times. สืบค้นเมื่อ 16 April 2011. ↑ Touch, Bora (2005-01-28). "Debating Genocide". The Phnom Penh Post. Archived from the original on 2017-01-28. สืบค้นเมื่อ 2017-01-28. ↑ Thet Sambath (20 October 2001). "Sister No. 1 The Story of Khieu Ponnary, Revolutionary and First Wife of Pol Pot". The Cambodia Daily, WEEKEND. สืบค้นเมื่อ 15 November 2007. ↑ Mydans, Seth (17 April 1998). "DEATH OF POL POT; Pol Pot, Brutal Dictator Who Forced Cambodians to Killing Fields, Dies at 73". The New York Times. สืบค้นเมื่อ 9 December 2015. ↑ Jackson, Karl D. (2014). "The Ideology of Total Revolution". In Jackson, Karl D. Cambodia, 1975-1978: Rendezvous with Death. Princeton University Press. p. 52. ISBN 9781400851706. สืบค้นเมื่อ 2015-04-17. 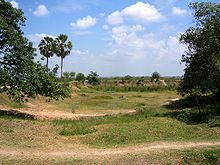 [...] the population of Democratic Kampuchea was divided into three categories, based on their class backgrounds and their political pasts: individuals with full rights (penh sith), those who were candidates for full rights (triem), and those who had no rights whatever (bannheu). [...] The lowest category, the bannheu or depositees, had no rights whatever, not even the right to food. These were former landowners, army officers, bureaucrats, teachers, merchants, and urban residents [...]. หน้านี้แก้ไขล่าสุดเมื่อวันที่ 20 กันยายน 2561 เวลา 11:18 น.